As the Ukrainian crisis has unfolded over the past few weeks, it’s hard for Americans not to see Vladimir Putin as the big villain. But the history of the region is a history of competing villains vying against one another; and one school of villains—the Nazis—have a long history of engagement with the United States, mostly below the radar, but occasionally exposed, as they were by Russ Bellant in his book Old Nazis, the New Right, and the Republican Party (South End Press, 1991). Bellant's exposure of émigré Nazi leaders from Germany's World War II allies in the 1988 Bush presidential campaign was the driving force in the announced resignation of nine individuals, two of them from Ukraine, which is why he was the logical choice to illuminate the scattered mentions of Nazi and fascist elements among the Ukrainian nationalists, which somehow never seems to warrant further comment or explanation. 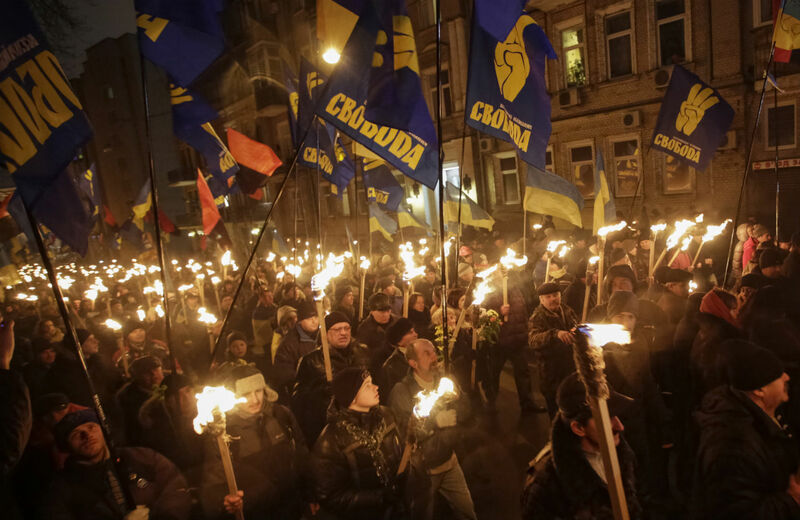 Of course most Ukrainians aren’t Nazis or fascists—all the more reason to illuminate those who would hide their true natures in the shadows…or even behind the momentary glare of the spotlight. Your book, Old Nazis, the New Right, and the Republican Party, exposed the deep involvement in the Republican Party of Nazi elements from Central and Eastern Europe, including Ukrainians, dating back to World War II and even before. As the Ukrainian crisis unfolded in the last few weeks, there have been scattered mentions of a fascist or neo-fascist element, but somehow that never seems to warrant further comment or explanation. I can’t think of anyone better to shed light on what’s not being said about that element. The danger of Russian belligerence is increasingly obvious, but this unexamined fascist element poses dangers of its own. What can you tell us about this element and those dangers? The element has a long history, of a long record that speaks for itself, when that record is actually known and elaborated on. The key organization in the coup that took place here recently was the Organization of Ukrainian Nationalists [OUN], or a specific branch of it known as the Banderas [OUN-B]. They’re the group behind the Svoboda party, which got a number of key positions in the new interim regime. The OUN goes back to the 1920s, when they split off from other groups, and, especially in the 1930s, began a campaign of assassinating and otherwise terrorizing people who didn’t agree with them. As World War II approached, they made an alliance with the Nazi powers. They formed several military formations, so that when Germany invaded the Soviet Union in June 1941, they had several battalions that went into the main city at the time, where their base was, Lvov, or Lwow, it has a variety of spellings [Lviv today]. They went in, and there’s a documented history of them participating in the identification and rounding up Jews in that city, and assisting in executing several thousand citizens almost immediately. They were also involved in liquidating Polish group populations in other parts of Ukraine during the war. Without getting deeply involved in that whole history, the Organization of Ukrainian Nationalists to this day defend their wartime role. They were backers of forming the 14th Waffen SS Division, which was the all-Ukrainian division that became an armed element on behalf of the Germans, and under overall German control. They helped encourage its formation, and after the war, right at the end of the war, it was called the First Ukrainian division. They still glorify that history of that SS division, and they have a veterans organization that obviously doesn’t have too many of members left, but they formed a veterans division of that. If you look at insignia being worn in Kiev in the street demonstrations and marches, you'll see SS division insignia still being worn. In fact, I was looking at photographs last night of it, and there was a whole formation marching, not with the 14th Division, but with the Second Division. It was a large division that did major battle around Ukraine, and these marchers were wearing the insignia on the armbands of the Second Division. So this is a very clear record, and the OUN, even in its postwar publications, has called for ethno-genetically pure Ukrainian territory, which of course is simply calling for purging Jews, Poles and Russians from what they consider Ukrainian territory. Also, current leaders of Svoboda have made blatantly anti-Semitic remarks that call for getting rid of Muscovite Jews and so forth. They use this very coarse, threatening language that anybody knowing the history of World War II would tremble at. If they were living here, it would seem like they would start worrying about it. Obviously these people don’t hold monopoly power in Ukraine, but they stepped up and the United States has been behind the Svoboda party and these Ukrainian nationalists. In fact, the US connections to them go back to World War II, and the United States has had a longstanding tie to the OUN, through the intelligence agencies—initially military intelligence, later the CIA. Yaroslav Stetsko was the number-two leader of the OUN during World War II and thereafter. In 1959, Stepan Bandera, who was head of the OUN, was killed, and that’s when Stetsko assumed the leadership. Stetsko was the guy who actually marched into Lvov with the German army on June 30, 1941. The OUN issued a proclamation at that time under his name praising and calling for glory to the German leader Adolf Hitler and how they’re going to march arm in arm for Ukraine and so forth. After the war, he was part of the key leadership that got picked up by the Americans. There’s a number of accounts I’ve seen, at least three credible reports, on how they were in the displaced persons camp—the Allied forces set up displaced persons camps and picked up tens of thousands of these former allies of Hitler from countries all over the East—Hungary, Latvia, Lithuania. There weren’t Polish collaborators; I think most people know the Germans heavily persecuted and murdered millions of Polish residents—but Bulgaria, Romania, Croatia and so forth, Belorussia. They had them in these camps they built and organized them, where the Ukrainians were assassinating their Ukrainian nationalist rivals so they would be the undisputed leaders of Ukrainian nationalist movement, so they would get the sponsorship of the United States to continue their political operation, and they were successful in that regard. So when Bandera was out of the picture, Stetsko became the undisputed leader of Ukrainian nationalists. The Organization of Ukrainian Nationalists in 1943 under German sponsorship organized a multinational force to fight on behalf of the retreating German army. After the battle of Stalingrad in ’43, the Germans felt a heightened need to get more allies, and so the Romanian Iron Guard, the Hungarian Arrow Cross, the Organization of Ukrainian Nationalists and others with military formations in place to assist came together and formed the united front called the Committee of Subjugated Nations, and again worked on behalf of the German military. In 1946, they renamed it the Anti-Bolshevik Bloc of Nations, or ABN. Stetsko was the leader of that until he died in 1986. I mention this in part because the OUN tries to say, Well, during the war we fought the Germans and the Communists. The fact of the matter is that they were the leadership of this whole multinational alliance on behalf of the Germans the last two years of the war and in the war thereafter. All the postwar leaders of the unrepentant Nazi allies were under the leadership of Yaroslav Stetsko. What happened when Stetsko, and others like him from other German allied forces, came to the United States? In the United States, when they came, his groups organized "captive nations" committees. They became, supposedly, the representatives of people who were being oppressed in Eastern Europe and the Baltic countries by the Soviet Union. They were, in fact, being given an uncritical blank check to represent the voices of all these nations that were part of the Warsaw Pact, when in fact they represented the most extreme elements of each of the national communities. The Captive Nations Committee in Washington, DC, for instance, was run by the person who headed the Ukrainian organization of nationalists; that was true in a number of places. In my hometown area near Detroit, as well, they played a major role. In the early 1950s, when they were resettled in the United States, there were at least 10,000 of them that were resettled, when you look at all the nationalities. They became politically active through the Republican National Committee, because it was really the Eisenhower administration that made the policy decision in the early 1950s, and brought them in. They set up these campaign organizations, every four years they would mobilize for the Republican candidate, whoever it would be, and some of them, like Richard Nixon in 1960, actually had close direct ties to some of the leaders like the Romanian Iron Guard, and some of these other groups. When Nixon ran for president in 1968, he made a promise to these leaders that they would—if he won the presidency, he would make them the ethnic outreach arm of the Republican National Committee on a permanent basis, so they wouldn’t be a quadrennial presence, but a continuing presence in the Republican Party. And he made that promise through a guy named Laszlo Pasztor, who served five years in prison after World War II for crimes against humanity. He was prosecuted in 1946 by the non-Communist government that actually had control of Hungary at the time (there was a period from ’45 to ’48 when the Hungarian Communist Party didn’t run Hungary). They were the ones who prosecuted him. He had served as a liaison between the Hungarian Nazi party and Berlin; he served in the Berlin embassy of the Hungarian Arrow Cross movement. This is the guy that got picked to organize all the ethnic groups, and the only people that got brought in were the Nazi collaborators. They didn’t have a Russian affiliate because they hated all Russians of all political stripes. There were no African-Americans or Jewish affiliates either. It was just composed of these elements, and for a while they had a German affiliate, but some exposure of the Nazi character of the German affiliate caused it to be quietly removed, but other [Nazi] elements were retained. Your book was researched and published in the 1980s. What was happening by that point in time, after these groups had been established for more than a decade? I went to their meetings in the 1980s, and they put out material that really made clear who they were. One of their 1984 booklets praised the pro-Nazi Ustashi regime in Croatia; these Ustashi killed an estimated 750,000 people and burned them alive in their own camp in Croatia. And here they are praising the founding of this regime, and acknowledging that it was associated with the Nazis, and it was signed by the chairman of the Republican National Committee. You couldn’t make this stuff up! It was just crazy. I interviewed the Cossack guy; he showed me his pension from service in the SS in World War II, and how he was affiliated with free Nazi groups in the United States, and he was just very unrepentant. These are the umbrellas that were called "Captive Nations Committees" by these people that Stetsko was over, and was part of, too. The Reagan White House brought him in, and promoted him as a major leader and did a big dinner. Jeane Kirkpatrick [UN Ambassador during the Reagan administration] was part of it, George H.W. Bush as Vice President, of course, Reagan—and Stetsko was held up as a great leader. And proclamations were issued on his behalf. When Bush Senior was running for president in 1988, he came to these, basically one of the leading locations of the Ukrainian nationalists in North America, which is just outside of Detroit, a suburb of Detroit, to their cultural center, and one of their foremost leaders in the world is headquartered out of there. At the time, he got Bush to come there and they denounced the OSI, and Bush just shook his head; he wouldn’t say anything about it. The OSI was the Office of Special Investigations. It was investigating the presence of Nazi war criminals in the United States, and deporting those who were found to have lied on their history when they applied to come into the United States after the war. They had deported a number of people from all over the United States. They had a lot of open investigations, and all these émigré Nazis were trying to bring all the political pressure they could to stop these investigations, including the Ukrainian nationalists. So they denounced them, the OSI investigations, in front of Bush. Bush nodded his head, but he wouldn’t say anything because he didn’t want to sound like he was sympathetic to the Nazi war criminals, but at the same time he didn’t want to offend his hosts by disputing the issue with them. So, the issue of World War II was still being played out over four decades later, in the politics of the presidency, and unfortunately Bush and Reagan continued to be on the side that we defeated in World War II. What was the response when your book came out, with all this information? How was the information received, and what was the political reaction? Prior to the book’s publication, Washington Jewish Week had done a story about some of the ethnic leaders of the Bush campaign and their history, like denying the Holocaust, or being involved with these émigré Nazi groups. They named a couple of them that weren’t part of the Heritage Groups Council, but they were part of the Bush campaign. Then, when I published the book, it brought out a lot more names, and the Philadelphia Inquirer and the Boston Globe did stories on them. It got to the point where when a reporter from the Philadelphia Inquirer would call them about one of their ethnic leaders of the Bush campaign, the standard response was, he’s no longer part of the campaign, and they’d say that almost as soon as the name would get mentioned. So that they would call that person—and I’ll give the example of Florian Galdau, he was, he ran the Romanian Iron Guard in New York City. He had a wartime record. [Romanian Archbishop Valerian] Trifa himself was implicated in the mass killing of Jews in Bucharest in 1941, I believe. Galdau’s record is clear, because when Trifa was prosecuted he was one of the people targeted by the Office of Special Investigations, and he was forced into deportation in the 1980s, but in those records, they identify Florian Galdau as one of his operatives, so his history is known—except, apparently, to the Bush campaign. So when he was identified by the Philadelphia Inquirer, they immediately said he wasn’t part of it, so the Inquirer called Florian Galdau, and he said, “No, I’m part of it. They never said anything to me. As far as I know I’m still part of the campaign.” And that was the pattern. The Republican National Committee said after the election that they were going to put a blue ribbon committee together and do an investigation of the charges in my book. I was never contacted, nobody affiliated with the book project, the publisher wasn’t contacted. None of the sources I worked with was contacted. And after about a year, with nobody raising any issues or questions about it, they just folded it up and they said, well, we have not had the resources to investigate this matter. I did publish an op-ed in The New York Times about two weeks after the election was over, and I think that was the last time anybody said anything publicly about it that got any kind of forum. I think they were allowed to just die and wither away—that is, those leaders. The Republican idea was probably to bring in another generation of people who were born in the United States as these émigré’s died off, but they never did anything about this history that Nixon had bequeathed them with. The Reagan White House had really made deep political commitments and alliances with them. They didn’t want to look like they turned their back on them, and Bush wanted them for his re-election campaign, so he wasn’t going to turn his back on them either. If you want an anecdote, I know that 60 Minutes was working on a piece that Bradley’s team was working on. Nancy Reagan herself called the executive producer and said that we would really like it if you wouldn’t do this story, and they killed it. Because, basically, it’s not just about Nazis and the Republican National Committee and the White House. It inevitably raises the question of, who are they, how did they get here, who sponsored them? And it goes back to the intelligence agencies at that point. And some people don’t like treading there; if it’s tied to an intelligence agency, they prefer to just stay away from the subject. So, some people at 60 Minutes were frustrated by it, but that’s what happened. I think that they were able to effectively kill the story when people tried to cover it. They were able to persuade news managers to not delve into it too much. What’s happened since you wrote your book, and most of the World War II generation died off? What have the OUN and its allies been up to since then that we should be aware of? Once the OUN got sponsored by the American security establishment intelligence agencies, they were embedded in a variety of ways in Europe as well, like Radio Free Europe, which is headquartered in Munich. A lot of these groups in the ABN were headquartered in Munich under the sponsorship of Radio Free Europe. From there, they ran various kinds of operations where they were trying to do work inside the Warsaw Pact countries. When the Soviet Union collapsed in 1991, a number of them moved back into Ukraine as well as the other respective countries and began setting up operations there, and organizing political parties. They reconstituted the veterans group of the Waffen SS, they held marches in the 1990s in Ukraine, and they organized political parties, in alliance with the United States, and became part of what was called the Orange Revolution in 2004, when they won the election there. The prime minister [a reference to Viktor Yushchenko, president of Ukraine from 2005 to 2010] was closely allied with them. They worked with the new government to get veterans benefits for the Ukrainian SS division veterans, and they started establishing the statues and memorials and museums for Stepan Bandera, who was the leader of the OUN, and who I should say were despised by other Ukrainian nationalists because of their methods, because they were extreme and violent toward rival Ukrainian nationalist groups. So Bandera wasn’t a universal hero, but this group was so influential, in part because of its US connections, that if you go online and you Google "Lviv" and the word "Bandera" you’ll see monuments and statues and large posters and banners of Bandera’s likeness and large monuments—permanent erected monuments—on behalf of Bandera so they made this guy like he’s the George Washington of Ukraine. That government was in power until 2010, when there was another election, and a new regime was elected with a lot of support from the East. Ukrainian nationalist groupings around the Orange Revolution were sharply divided against each other, and there was rampant corruption, and people voted them out. The United States was very aggressive in trying to keep the nationalists in power, but they lost the election. The United States was spending money through the National Endowment for Democracy, which was pumping money into various Ukrainian organizations, and they were doing the same thing in Russia and many other countries around the world as well. We’re talking about many millions of dollars a year to affect the politics of these countries. When the occupations came in Independence Square in Kiev late last year, you can see Svoboda’s supporters and you can hear their leaders in the Parliament making blatant anti-Semitic remarks. The leader of the Svoboda party went to Germany to protest the prosecution of John Demjanjuk, who was the Ukrainian who was settled in the United States who was implicated as a concentration camp guard in the killing of innocent people. The German courts found him guilty, and the Svoboda leadership went to Germany to complain about convicting this guy. The reason? They said they didn’t want any Ukrainians tainted with it, because they live a lie: that no Ukrainian had anything to do with the German Nazi regime, when history betrays them, and their own affiliations betray them. But they don’t like that being out there publicly, so they always protest the innocence of any Ukrainian being charged with anything, regardless of what the evidence is. Your book was an important revelation but was not alone. Your book notes that Jack Anderson reported on the pro-Nazi backgrounds of some of the ethnic advisors as far back as 1971, yet when your report came out almost two decades later, everyone responded with shock, surprise and even denial. What lessons should we draw from this history of buried history? And how should it influence our thinking about the unfolding crisis in Ukraine? I don’t believe it’s ever too late to become familiarized and educated about the history of this phenomenon—both the wartime history and our postwar collaboration with these folks. There were a number of exposés written about the émigré Nazis. There was a 1979 book called Wanted, and it did a number of case stories of these people being brought into the United States, including the Trifa story. Christopher Simpson did a book called Blowback that discussed the policy decisions; it’s an incredible book. He’s a professor at American University, and he did years of research through the Freedom of Information Act and archives, and got the policy documents under which the decisions were made to bring these folks together, and not just into the United States but to deploy them around the world. Like my book, it didn’t get the attention it deserved. The New York Times book reviewer was negative toward the book. There are people who really don’t want to touch this stuff. There’s a lot of people who don’t want it touched. I think it’s really important for people who believe in openness and transparency and democratic values, who don’t want to see hate groups come back to power in other parts of the world, to know what happened. There aren't very many Americans who really even know that the Waffen SS was a multinational force. That’s been kind of kept out of the received history. Otherwise people would know that there were Ukrainian Nazis, Hungarian Nazis, Latvian Nazis, and they were all involved in the mass murder of their fellow citizens, if they were Jewish, or even if they were co-nationalists that were on the other side of the issue of the war. They were just mass murderers, across Eastern Europe. And that history, those facts, aren’t even well-known. A lot of people didn’t even know this phenomenon existed. I think all Americans have a responsibility to know what their government is doing in the foreign policy in Europe as well as elsewhere around the world, as well as Latin America, as well as Africa. Since our policy was to uphold apartheid in South Africa, why weren’t Americans challenging that more? They began challenging that in the '80s, but the apartheid regime was run by the Nazi party. They were allied with Germany in World War II. They were the Nationalist party and they took power in 1948 and the United States backed that for decades. We backed the death squads in Latin America, even though they massacred tens of thousands of people—200,000 people in Guatemala alone. Americans aren’t being attentive to what their government is doing abroad, even though it’s being done with their tax dollars and in their name, and I think we just have a general responsibility. I went to these meetings, I went to these conferences, I went over a period of years. I met with them directly, most of the people I wrote about, I met with them personally or in group meetings. People can’t afford to do that on their own, timewise, but there’s enough literature out there so they can read about it. They will get enough of a handle to get what the real picture is, to demand change. I’m not totally partisan: I think the Republican Party was extreme on this, but the Democrats folded and didn’t challenge this when they knew it was going on. There is an old Roman poet who once said truth does not say one thing and wisdom another. I’m a believer in that. Tell the truth and wisdom will follow. Paul H. RosenbergPaul H. Rosenberg is a columnist for Al Jazeera English and senior editor for Random Lengths News.